ST. GEORGE – Many of the world’s best triathletes will race alongside thousands of amateur triathletes Saturday for the 2016 Ironman North American Pro Championship St. George. This race marks the seventh consecutive year that St. George will host an Ironman or Ironman 70.3 triathlon. It’s a tradition that will continue for at least another four years thanks to an agreement reached in 2015 that will maintain this event’s designation as the Ironman 70.3 North American Pro Championship. The St. George race’s prize purse is $100,000, which will be distributed amongst the top 10 male and female professional finishers. In addition, over 2,500 registered athletes will vie for 30 coveted age group qualifying slots for the 2016 Ironman 70.3 World Championship taking place in Sunshine Coast, Queensland, Australia, on Sept. 4. 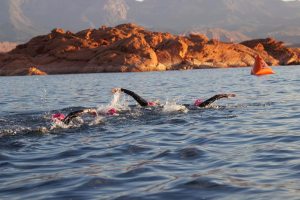 “This is an exciting race with a lot at stake for the professionals, in addition to it being a gorgeous destination for the age group athletes,” said Roxie Sherwin, Director of the St. George Tourism Office. St. George is one of only six regional Ironman 70.3 Regional Championship destinations in the world. The course has quickly become an athlete favorite because of its challenging topography, eye-popping scenery and helpful volunteers. The field of professional athletes registered for this year’s Ironman 70.3 North American Pro Championship St. George is strong, having combined for nine Ironman or Ironman 70.3 World Championship titles. The pro field also boasts an additional 17 Ironman or Ironman 70.3 Regional Championship titles. Notable pros gearing up for the race include Mirinda Carfrae, Sebastian Kienle, Tim O’Donnell, Michael Raelert, Lionel Sanders and Amanda Stevens, in addition to former St. George champions Ben Hoffman, Meredith Kessler, Brent McMahon and Heather Wurtele. Kessler and Wurtele have split the previous six St. George race championships on the female side. A full list of professional participants for the Ironman 70.3 North American Pro Championship St. George can be found here. Ironman 70.3 North American Pro Championship St. George boasts participants representing 24 countries and 46 states. Utah is the most represented state with 839 registered athletes. The oldest competitor is 75 years old; the youngest is 18. The race offers spectators and athletes unrivaled vistas as the course winds its way through a 1.2-mile swim at Sand Hollow State Park, a 56-mile bike ride through Snow Canyon State Park, and a 13.1-mile run that ends at Town Square Park in the downtown historic district.